The world is no longer a collection of separate countries. Technology has allowed us to develop a global economy; like a long line of dominoes, we are all connected. And I don’t have to explain what happens when just one domino falls. While the mainstream media continues to ignore it, the last two months have shown the biggest decline in the global stock market since 2008 – yet everyone continues to think hard times are temporary. I hope they are right! The stock market crash to which I am referring happened on September 29th, 2008. The DJIA fell 777 points that day. Today’s market crash isn’t limited to a single day, it has been creeping up on us. Take a closer look and you’ll see that the DJIA has fallen almost 3x as much as it did in 2008. On top of that, the U.S. has experienced the 8th and 10th largest stock market crashes in American history (based on points) during the last 60 days. And this is mild compared to what is happening in other countries. China: The world’s most populous country is experiencing a 79-month low in regards to its manufacturing index. The Shanghai Composite Index has fallen almost 40% this year. Germany: The Audi/Volkswagen emissions scandal is making global headlines while an influx of Syrian refugees threatens Germany’s economy and culture. Germany’s banks are in trouble and their stock market has lost about a quarter of its value. Japan: After violent fluctuations, the Nikkei Index has finally settled at a number 3,000 points lower than its highest point in 2015. France: Hoping that it doesn’t suffer the same fate as Greece, France is trying to figure out what to do with a stock market that continues to fall (it has already dropped 18%). Brazil: The centerpiece of the 2015 financial crisis in South America, Brazil’s market has plummeted over 12,000 points and the nation has entered a recession. India: What does the future hold for this major exporting country? Indian stocks have fallen by 4,000 and analysts are concerned that the trend will continue. Those who are paying attention cite a curious, seven-year cycle that continues to plague the world’s economies: it began in 1966 with a stock market crash of 20%. Next came a 45% crash in 1973-74. Following that was the start of the “hard recession” in 1980. Seven years later was 1987 and Black Monday. In 1994 the bond marked crashed. Seven years later was 9/11. Following that was the financial collapse of 2008. Fast-forward seven more years to…2015. While many people were expecting a big event to occur on September 14th, we have to understand that crashes and catastrophes aren’t limited to a single day. And neither is the aftermath. The imminent “economic collapse” will not be something we recover from over a day, a week, even a month. The world will endure a very long crisis. And the suffering will be unimaginable. Take Los Angeles, for example: on Tuesday the mayor announced “an emergency” due to the incredible amount of homeless people in the city. 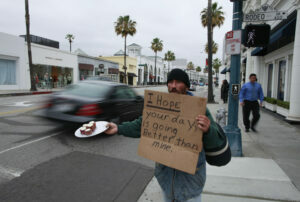 Officials proposed a $100 million plan to help the estimated 26,000 people living on LA’s streets. This number has increased by 85% during the last two years. The effects of poverty can be seen in many areas of the nation. The 46 million Americans who depend on food stamps are worried about the potential government shut down this month that could suspend those payments. When will everyone wake up? I can only hope they realize what is happening in time to prepare…before they are the ones forced to beg on the street in order to feed their children.